A newspaper article published by The Oviedo Outlook on May 26, 1977. The article describes the winners of a literary contest sponsored by the Seminole County Language Reading Arts Council. According to the article, ten students from Jackson Heights Middle School, located at 41 Academy Avenue in Oviedo, were selected to have their works published in the Seminole County Literary Magazine. 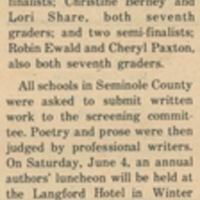 Additionally, an annual authors' luncheon was to be held at the Langford Resort Hotel in Winter Park. Original newspaper article: "Students Honored for Poetry." The Oviedo Outlook, Vol. 4, No. 40, May 26, 1977, page 9: Oviedo Historical Society, Oviedo, Florida. Digital reproduction of original newspaper article: "Students Honored for Poetry." The Oviedo Outlook, Vol. 4, No. 40, May 26, 1977, page 9. “Students Honored for Poetry.” RICHES of Central Florida accessed April 22, 2019, https://richesmi.cah.ucf.edu/omeka/items/show/5669.